Seniors graduating in December – this post is for you! It is imperative to start your job search months before you graduate, because you don’t want to graduate in December and not have a job lined up. Job searching is a full time job in itself! That’s why you should start early and set yourself apart from the rest of the competitive candidates. Below I’ve listed five of my favorite job search tips that have worked for others and will probably work for you, too! The Hawk Career Fair, an annual event put on by Career & Leadership Development, will be held on Wednesday, September 25 from noon to 4 in the Williams Center. You can RSVP to the fair through our Facebook page to get updates and information about the fair. More than 100 employers will be there looking for interns and employees. Some employers include Target, Maurices, Generac, We Energies, and Quad/Graphics. Juniors and seniors are strongly encouraged to attend the Hawk Career Fair. Business professional or business casual dress is recommended. What else should you bring besides your snazzy self? At least ten copies of your resume, a padfolio (we’re going to be giving away a bunch of padfolios during the school year, so keep us on your radar! ), pens, and business cards, if you have them. Also make sure to prepare your elevator speech. We’ll be going over more information about the career fair in the next few weeks. 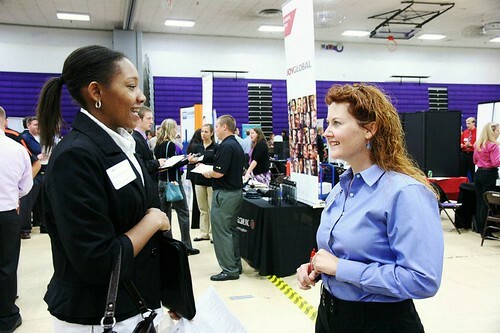 Attending the career fair will help you get your foot in the door, especially if you want to work for one of the companies attending the fair. Make sure you do your research on the fair, which can be found on Hawk Jobs, to secure a great job after graduation. As a senior, you’ve probably made tons of friends and connections, through your peers, coworkers, professors, supervisors, and friends-of-friends. Remember when you were a freshman and didn’t know anyone, not even your roommate? Look how far you’ve come. Use those connections to your advantage! Having lots of friends isn’t just good for your social life. It’s good for your professional life as well. Knowing people is everything. You may have gotten to know professors, managers, student leaders, or advisors. Spread the word that you’re looking for a job in a particular field, and one of your colleagues or friends may stumble upon something that is right up your alley. I’ll admit it – I’m a Twitter fanatic. Having been the UWW Career Twitter manager for the past year, I know a bit about utilizing Twitter to your advantage. There are many ways you can get resources off of Twitter. For example, you can search for something using hashtags. The #1 word to find a hiring company is… #hiring. Next up? #tweetmyjobs and #jobopening. Why not tweet and give it a shot? You can also follow career centers on Twitter. My favorites are Career Bliss, Career Realism, Brazen Careerist, and Career Builder. These accounts constantly tweet out job openings, interview tips, job search advice, and interesting career-related articles. Be sure to follow us on Twitter, too! If you’re a senior and you have yet to take advantage of our career services, it’s not too late! We would rather see you late than never at all. Some of our services include resume checking, doing mock interviews, helping you get involved, and figuring out your career path. The career staff also has many resources to help you find a job in the field you want to get into. They may refer you to job boards such as Big Shoes Network (most commonly used by students in the College of Arts & Communication) or Hawk Jobs (our own job board). While some may say that your online presence may replace resumes in a few years, you can’t argue with the fact that what you post, tweet, or blog about online is more influential than ever. Once you click send, that tweet or blog post is on the Internet forever. If you want your digital footprint to be a positive and professional one, make sure you have a profile on LinkedIn. ‘LinkedIn is a networking tool that helps you discover inside connections to recommended job candidates, industry experts and business partners.’ It is a great website to be on, so I highly recommend setting up a profile. If you do already have a profile, start networking with other professionals on LinkedIn. Connect with your peers, endorse them for skills, join groups, and have conversations. Make your presence known. Who knows – maybe that HR professional you had a conversation with on a LinkedIn article will mention a job to you? Many of my peers have LinkedIn profiles, but not the best profile pictures. Having a professional picture is key – that is one of the first things employers look at when they view your profile! The two other social media managers and I will be hosting a free LinkedIn Headshot Photoshoot outside the Hawk Career Fair on September 25. It will be quick and painless, and we encourage you to stop by and get your picture taken! December grads, what other steps have you taken towards your job search? This entry was posted in Friday Favorites, Job Search Strategies and tagged career fairs, Hawk Career Fair, Kelsey Welke by Kelsey Welke. Bookmark the permalink.